Black and White and Loved All Over: Hello, Sunshine! The high was in the '90s in Nashville today. I'm one of five people in Nashville who (mostly) loves the heat. And it's smothering heat, like being trapped inside an attic. I feel more alive in the summertime. I feel happier and somehow younger and more feminine and more like myself. It's as though the possibilities for fun stretch out endlessly before me in a long line of imaginary swimming holes and lake houses and backyard parties and rolled-down windows. For me, the whole year seems to lead up to this moment--the beginning of summer. 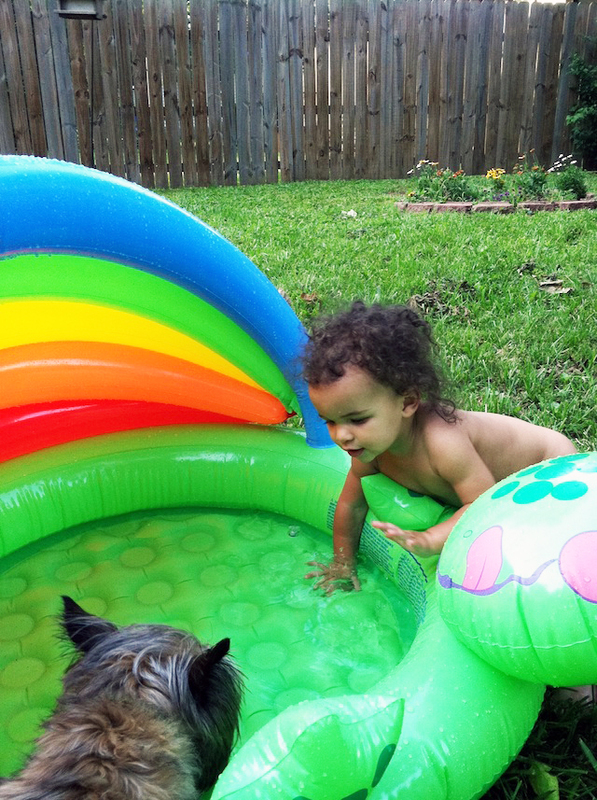 I used a bicycle pump to blow up Tessa's kiddie pool late this afternoon. 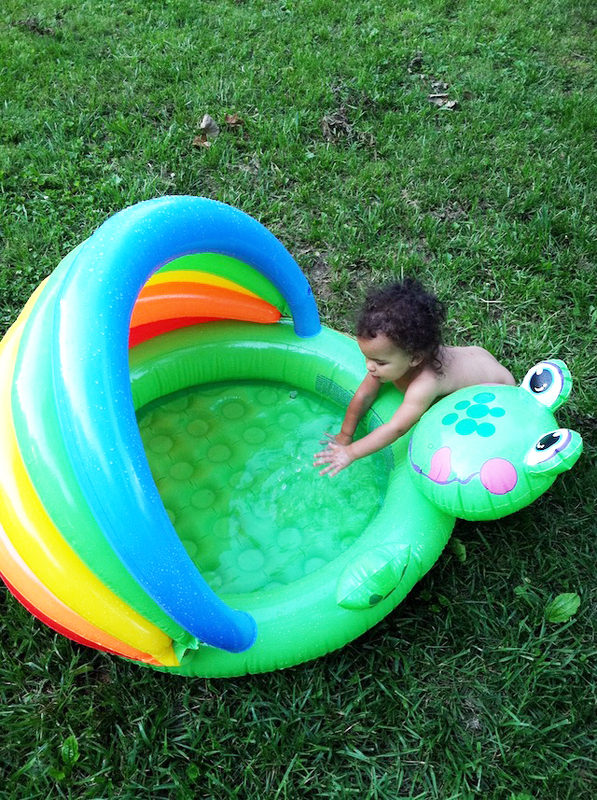 We got it last summer but she was basically a tadpole then; we were way too premature with that particular purchase. A year goes by, though, and the timing is perfect. Of course, she sat on it the whole time I was blowing it up, getting more and more excited as the flattened frog became a puffy rainbow frog. I filled it up with the hose pipe and put her next to it so she could decide for herself that it would be a good idea to get in. Her decision-making process took three minutes. Minute one: "Ohhh... splashy time!" Minute two: "Garp likes it. I like it. It's hot. Why not?" Minute three: "I think I'mma get in this. Woo-wee, mama, won'tcha look at me! Why didn't I think of this earlier?" awesome!!!! i'm the opposite. i always feel better and more like myself with cold. but not too cold! A kiddie pool is definitely on my shopping list this summer. Tessa looks like she loves it! Ellen, my heart just melted. Can you spoon it up and return it to me?